It is becoming increasingly important for Native American tribes to communicate the sustainability of their wild plant harvesting methods. 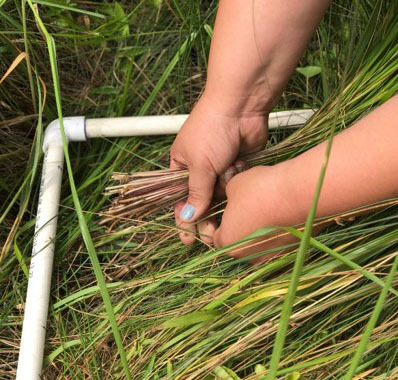 While conventional wisdom suggests that harvesting wild plants can often be detrimental to populations, researchers are working with Wabanaki sweetgrass gatherers to explore how traditional harvesting techniques can enhance, rather than diminish, plant populations. Culturally significant plants provide food, medicine, craft material, and spiritual connection for Native American communities. Understanding how traditional ecological knowledge (TEK) can contribute to the sustainability of plant harvesting is important for conservation and management decisions. Sweetgrass, native to wet habitats in northern North America, is esteemed by Wabanaki tribes (Maliseet, Mi’kmaq, Passamaquoddy, and Penobscot) of Maine. Sweetgrass is used for basket making and spiritual purposes. In collaboration with Wabanaki gatherers, scientists from the University of Maine, Acadia National Park, and the Eastern Forest Environmental Threat Assessment Center embarked on a project that will help guide sustainable harvests based on tribal-led research and observations from test plots in the park. Experimental harvest results demonstrate a significant increase in sweetgrass stems after harvesting. Unharvested control plots did not demonstrate significant increases, reinforcing Wabanaki TEK that correct harvest techniques enhance sweetgrass populations. This research will contribute to an environmental assessment that will support Wabanaki peoples’ requests to gather plants within Acadia National Park boundaries, pending a new agreement to ensure the sustainability of the resource. This type of work is increasingly important as the USDA Forest Service is committed to conducting research with federally-recognized tribes that incorporates TEK and focuses on issues important to Native communities.